Gorgeous, Stina!!! Barb, dogs are hard. I shoot them with a shutter of 4000+. Stina I love the butterfly! And you got a "twofor"!!! A bee to boot!! Nice shot!! I had a very impromptu photo session with a very active dog yesterday....not the best shots, but had a lot of fun! The first one the shutter was slow, but I loved the determined look on his face! I love the expression on his face in that first one. Thank you, Maureen. That old barn looks like a neat place to photograph, I'm glad you had fun. I really like this shot too Stina Beautiful color and such great compositional balance. Maureen, that little chunky fellow is cute as can be. Love Ella's picture. She is already growing so fast. 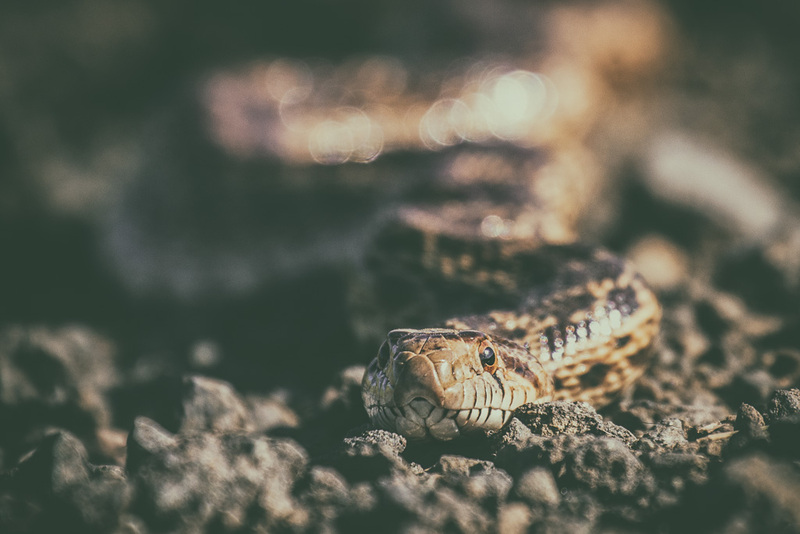 I ran across this beautiful gopher snake this weekend. LOL, "he is a she" but I agree it is hard to tell in that outfit. I should have also posted pictures of her in her Easter dress we did the same day. I have had a busy week outside of having the 3 boys here. I have been out working to get my yard ready to be rototillered on Saturday, buying pea gravel & rock, ordering plants. etc. On the upswing, Skip had his last radiation treatment on Tuesday. Now we have a little 6 week break before they do an MRI & see where we are at. My wrist is doing better; not as much pain unless I over-do it or move it a wrong way & the awful nerve is starting to settle down a bit. I am pretty sure it will never feel completely right again. Next week, we leave for Vegas, then Arizona. Looking forward to getting away for a little bit but also to see how my new car will do out on the open road. Maureen - always cute baby pics! We are getting ready to pull out of here on Friday for Vegas, then Utah over the weekend & Monday we head in to Page, Arizona for 3 days. From there we will go to Sedona & back home for Mothers Day. We will enjoy a full day of Antelope Canyon in Page as well as sunset photography at Horseshoe Bend & one day trip along the North Rim of the Grand Canyon. I love the west & southwestern states!! I have been all over this country about 5-6 times & it is so amazing at the variety of terrain & how beautiful it is. Pics or it didn't happen Maureen! Hope you have a great trip. Patience, Mark. I am sure I will have plenty. Ella is 3 months old tomorrow so we did pictures before I left. She is settling down & talking & cooing & I am so in love with her.